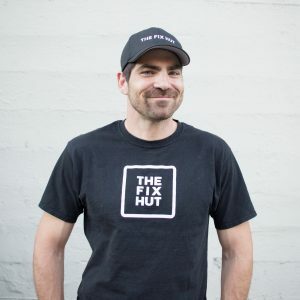 These days, if he’s not in one of The Fix Hut shops, you can find Matt skiing on Mt.Hood or home with his family. That wasn’t always the case. While working in the local restaurant scene, Matt started fixing iPhones via craigslist ads in 2008. Pretty soon after, he and his girlfriend opened their first little shop by the streetcar stop in NW Portland. After marrying his love on Mt.Hood, he started his family while opening the second store in Tualatin. 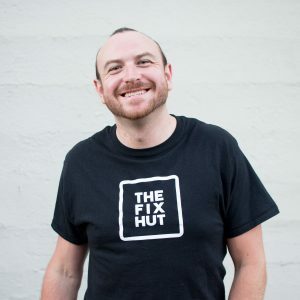 Soon after, he teamed up with his best friend Peter to open the next two locations. Matthew takes pride in his team of hard-working techs, being a part of the local small business economy, and his happy customers! Matt and Peter are long time besties, and while it’s been said not to go into business with your best friend, they’re busy proving this is just a myth. Usually found in the NE Alberta shop, Peter is sure to greet you with the warmest smile and quick to figure out how to help. Beyond his expertise in fixing phones, laptops, and tablets, Pete is also well versed in cars. But, mostly he loves anything in the great outdoors. Going hiking, camping, dancing, skiing, and anything-ing? Invite Peter! 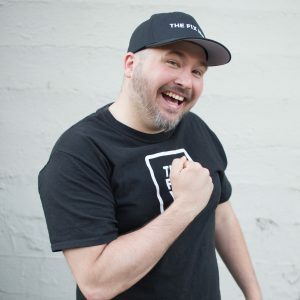 It’s usually pretty easy to spot our New Jersey-native lead tech on the streets of NW Portland or heading up the shop in Tualatin because he drives one of our wrapped cars featuring a broken iPhone splashing out of water! He’s usually rocking a ghost-busters or nintendo-themed belt buckle and making someone laugh out loud. He is as genuinely kind as he is helpful and his many years of tech-savvy experience leave us confident he can fix your device in a flash! 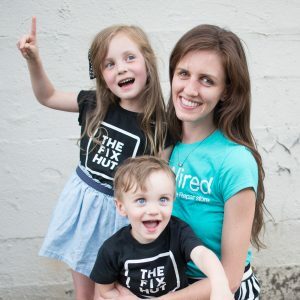 Samantha is the do-it-all, catch-all mama bear of the Fix Hut Family (and the Moore family). Busy raising the two toddler Fix Hut kids, she has been working behind the scenes of the iPhone repair biz from day one. 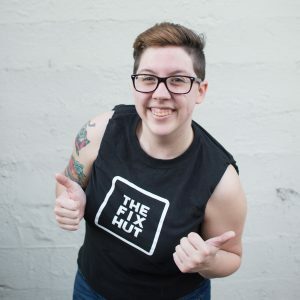 Samantha has been responsible for all the cute iPhone shaped business cards, website, events, signage, and loves to keep things chugging along on social media with Facebook and Instagram. She and Matthew have been together long before there was a Wired iRepair or The Fix Hut, when they built their careers together as destination wedding photographers. Samantha still heads up the photograph business, So Many Moments. Hailing from Arkansas, Alex has made herself a home in beautiful, sunny Portland, OR. When she’s not meticulously repairing iPhones and iPads, she can be found trying out new recipes. When the weather cools down, buddy up with this one if you want to score a stellar chocolate chip cookie! When she’s not cooking, she’s probably taking photos of her cat with her phone. Hundreds of photos of her cat. Because her cat is really cute. Duh. New Jersey crew Padilla has been challenging our manager Mistretta to video games since they were 12. 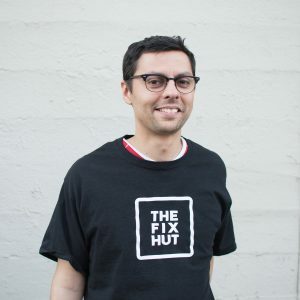 Now that Mike talked him into moving back out West, we’re so happy to have him on our team! When he’s not geeking out the Playstation, he’s geeking out at work keeping all the technical things technical and technically sound. We are grateful for the magic that is Michael! 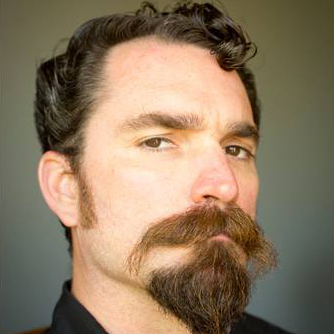 Most people knew our manager by his giant beard, but now his mustache is just as impressive. After years living on the Big Island in Hawaii, he couldn’t leave the boat culture behind him so if you don’t catch Doug at one of the shops, he might be your jet boat tour captain out on the Willamette for a tour of Portland. Multi-talented, family man Doug is simply a ridiculously rad guy. Mahalo!